One week from tonight, the Philadelphia Eagles will raise their first-ever Super Bowl banner at Lincoln Financial Field when they kick off the 2018-19 NFL season against the Atlanta Falcons. 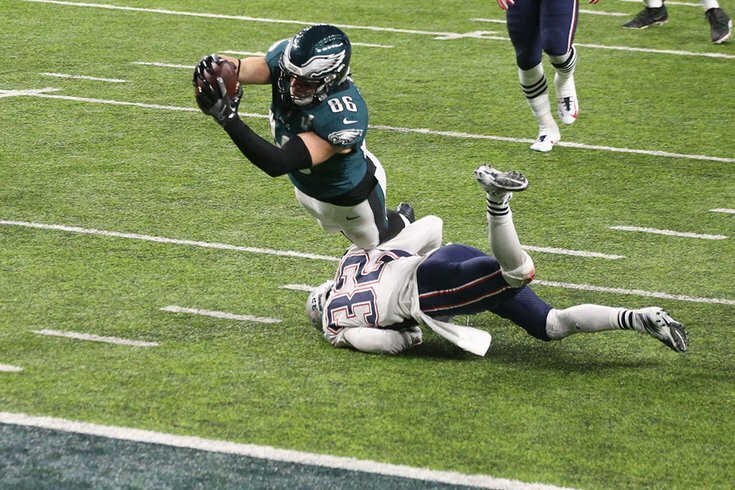 One of the critical plays that cemented the Eagles' 41-33 victory over the Patriots in February was a fourth quarter, go-ahead score by tight end Zach Ertz. Along with Corey Clement's back-of-the-end-zone catch, the Ertz play was one of two Eagles touchdowns that generated intense debate among the officials and fans. Based on the language of the rule book, they were both close calls. Inconsistent rulings by refs throughout the season only complicated the interpretation. Nobody drew the ire of Eagles players and fans more than NBC broadcaster Cris Collinsworth, who guessed incorrectly in both cases and believed the touchdowns should have been overturned. Defensive end Chris Long exaggerated how badly Collinsworth seemed to get it wrong. And Eagles fans – many already believing the hall-of-fame former Cincinnati Bengals receiver had an anti-Eagles bias before the Super Bowl – launched a petition to ban Chris Collinsworth from ever calling a Philly game again. In an interview previewing the Eagles' matchup against the Falcons next week, Collinsworth admitted he should have kept his mouth shut about the Ertz touchdown, which he had likened to a crucially overturned touchdown in a late season Steelers-Patriots game. "[T]he first words out of my mouth, I wish I just stuck with these, was: 'I have no idea what they're going to call on this.' The ball bounced out, we've seen 1,000 different things," Collinsworth said. "So the baseline thing is you've got to survive the ground, right? That's the rule, you've got to survive the ground ... 'Well, I guess they're going to have to overturn this one.' Oh, man, I wish I never said that." If he knows what's good for him, Collinsworth will tread more carefully on Thursday night.